Are you looking for a wedding for just the two of you, we specialize in Florida Beach Elopements! Just because you want to elope, doesn’t mean you want to give up the beautiful beach décor and professional ceremony photography. 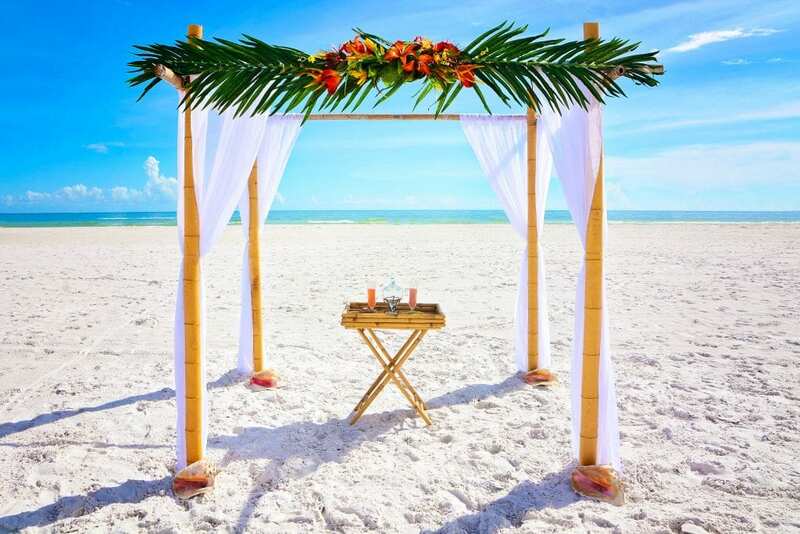 Our Florida Beach Elopements include natural four-post bamboo canopy, sand ceremony, and ceremony officiant. When you elope to Florida for your beach wedding, you can plan to wear whatever you both want. From formal gowns and suits, to sun dresses and linen shirts, your attire will add to the uniqueness of your elopement ceremony. You just want the beach wedding ceremony to be about the two of you. You just want to share the experience with each other, and possibly a few guests. You are planning a trip to Florida anyway, and you want to marry the love of your life — why not make it the most memorable vacation you will take? You want a honeymoon in Florida, but you don’t really want to plan a large wedding. Now you can have a beautiful beach wedding elopement, and start your honeymoon right after the ceremony! A destination wedding on the beach is what you are looking for, but don’t want the hassle, and expense of leaving the States, a wedding ceremony in Florida is a great choice. 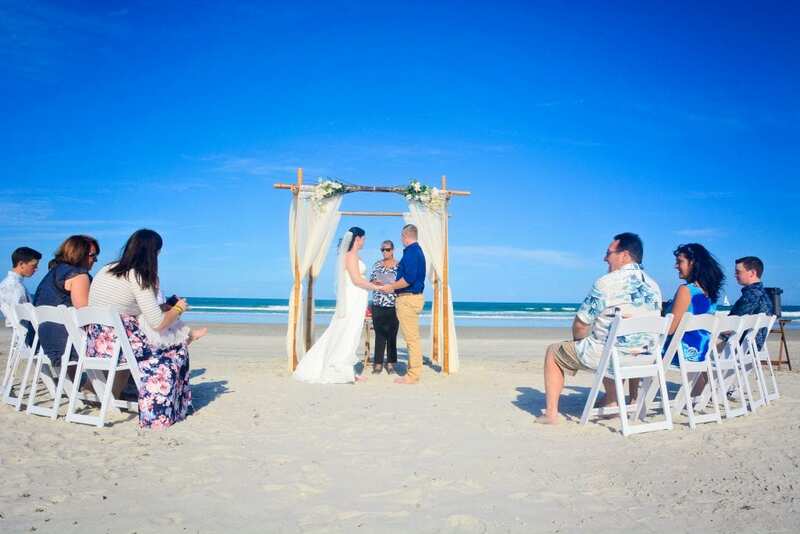 If you are already married, but want to renew your vows, Florida Beach elopements are perfect in celebrating your continued commitment to each other. If a Florida Beach Elopement is exactly what you were looking for, check out our Simply Florida Elopement Package below. 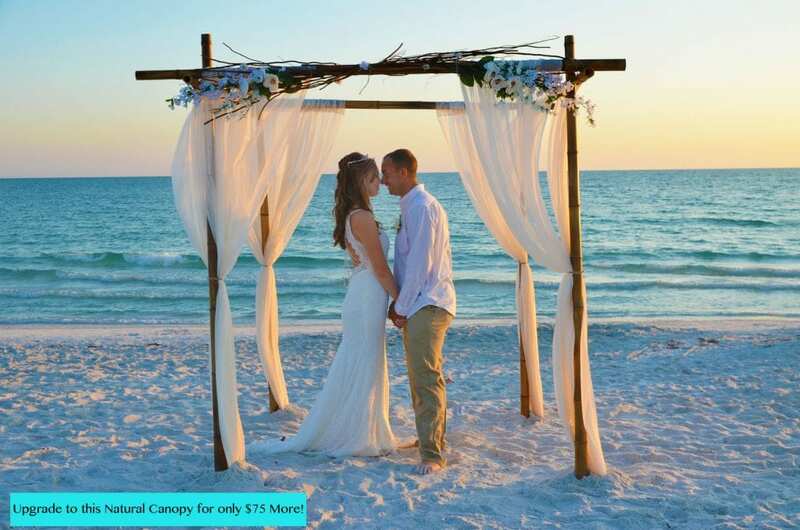 Florid Beach Elopements Package Explanation: This package is ideal for a small, but important, beach wedding ceremonies (or vow renewals) for the bride and groom, and up to six guests. The only items you can add to this package are: additional ceremony photography, recorded music for your first dance under the bamboo canopy, The Simply Deluxe Choice, or an upgrade to the Natural Bamboo Canopy or the Tropical Canopy selection. Otherwise, there is no processional, no bridal party, no chairs, or added decorations. This package is strictly for Florida Beach Elopements. We will meet you at the designated Florida beach area, where you will stand under the bamboo canopy for your destination beach wedding ceremony. If you will be having any guests (up to six guests), they will stand on either side of the canopy to witness your marriage. This Florida Simply Deluxe Package includes ceremony music and chairs for your guests with an option to purchase spandex chair bands to enhance your decor. You can still upgrade to the Natural Bamboo Canopy and the Tropical Bamboo Canopy Decor. With our Simply Florida Elopement Package, you can choose from two types of ceremonies (civil, or non-denominational with a prayer). You can certainly have your own personal vows prepared for each other. In fact, I encourage this. When it is just the two you, at your Florida beach wedding ceremony, it is a nice, and memorable touch to write your true feelings to each other. You can make your personal vows funny and sincere (what you “nicknames” for each other are, why you will be sad with them when their favorite team loses…). Because this is a ceremony designed for just the two of you, you can personalize it just like you want it. 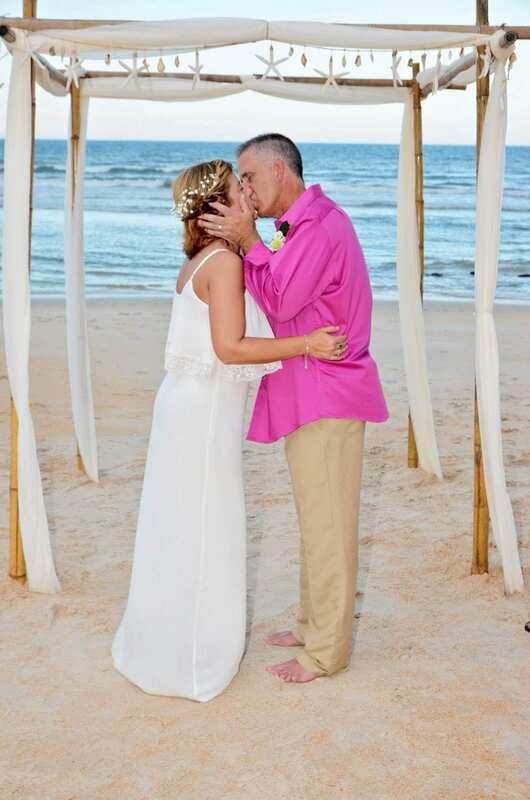 Florida Beach Elopements are perfect for vow renewal ceremonies, too! If you want to celebrate your continued success in your marriage, what better choice than a Florida beach wedding ceremony. If this beach wedding ceremony, or vow renewal ceremony, will be a family affair with your children in attendance, you can include them in your ceremony. This beach wedding package includes a sand ceremony. Each member of the family, can be represented by a color of sand. During the sand ceremony, each member of the family will be able to pour their sand into the main vase to represent their importance, and commitment to this family. What a great keepsake of your Florida destination wedding. Florida Beach Elopements are one of the top ten reasons why people visit this state. We hope you will join us at the beach for your wedding ceremony! Ready to reserve your date? Contact us today.